Young pianist Peter Edwards is a postgraduate of Trinity College of Music who has recorded with the Abram Wilson quartet as well as co-writing material and arranging the excellent latest album by Zara McFarlane ‘If you knew her’. Having studied under the likes of Gary Crosby and Liam Noble among others, the trio was formed by Edwards in 2010 and comprises twenty-five year old Max Luthert on the double bass and twenty-two year old Moses Boyd on the drums with the leader now in his early thirties. 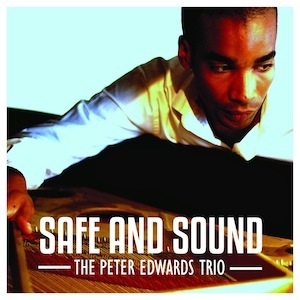 Peter Edwards has soaked up the influences of acoustic period Chick Corea, Herbie Hancock and Ahmad Jamal, yet has still managed to create his own individual sound and the all bar one original compositions are on the whole excellent, at once challenging and melodic. Immediately of interest is the delicious bass line that greets the listener on the Latin-jazz flavoured ‘Meet you at El Malecón’ on which Edwards really stretches out over a repeated bass riff. On the title track the use of repetitive piano vamps and drum rolls is reminiscent of EST and this both a deeply lyrical and soulful number. The reflective piece ‘Desdemona’s tears’ provides the opportunity for Luthert to shine with an intricate solo while Edwards muse in the background while ‘Hustle Bustle does exactly what it says on the proverbial musical tin. The trio have performed this year at the Pizza Express in Soho and the best is still very much to come with the old adage that practice makes perfect applying here. Definitely a name to watch out for in the next few years to come.